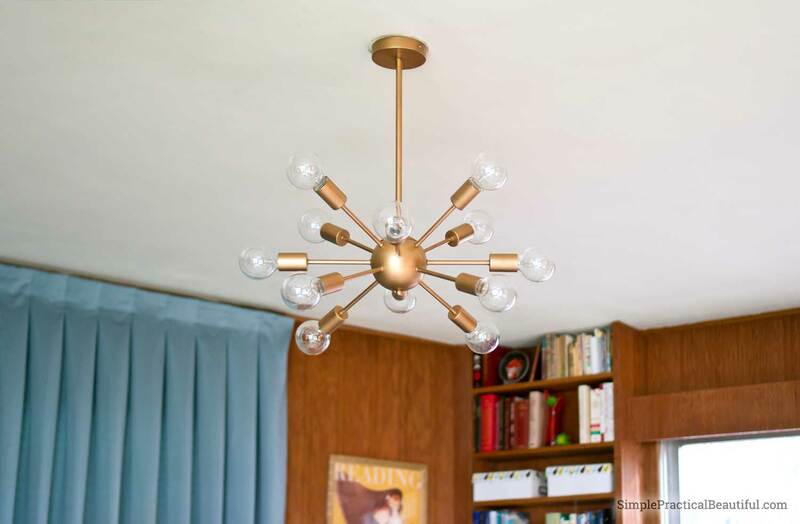 An affordable sputnik light is a fun lighting accessory to add to any mid-century room. It looks great and really lights up the room. I love our mid-century family room with it’s vintage wood paneling, shag rug, and the starburst we hung up when we first moved in. It’s a fun room, and the decor reflects the fun times we have as a family in that room. However, there are still a lot of improvements that need to happen to finish decorating the room. The most urgent was the lighting. Lighting in any room makes all the difference. Good lighting not only lets you see what’s going on, it can also highlight the best parts of the room and make the space feel more welcoming and open. Our family room has three huge windows, so during the day it is very well-lit and has wonderful lighting. Nighttime was another story. The one light in the center of the room was terrible. It was a dim and cast a strange green/yellow light. 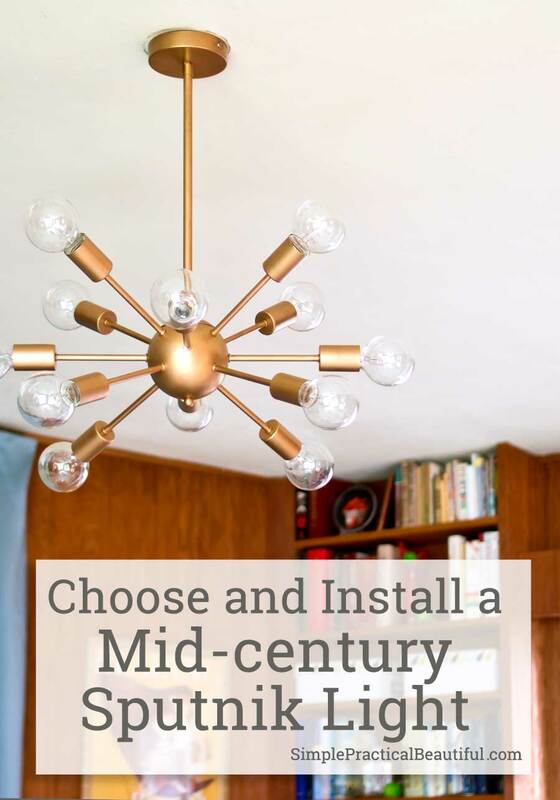 Yes, it was vintage 1950’s but it was not the cool mid-century modern type of lighting, more like “midcentury worn-out and should have been replaced decades ago” type of lighting. It looked like it once had painted flowers on it. It now just has smudges of yellow that looked dirty. Plus, it’s shaped like a bowl so it held every bug that ever died near it. Gross. This post contains affiliate links. Click here for more information and my full disclosure. 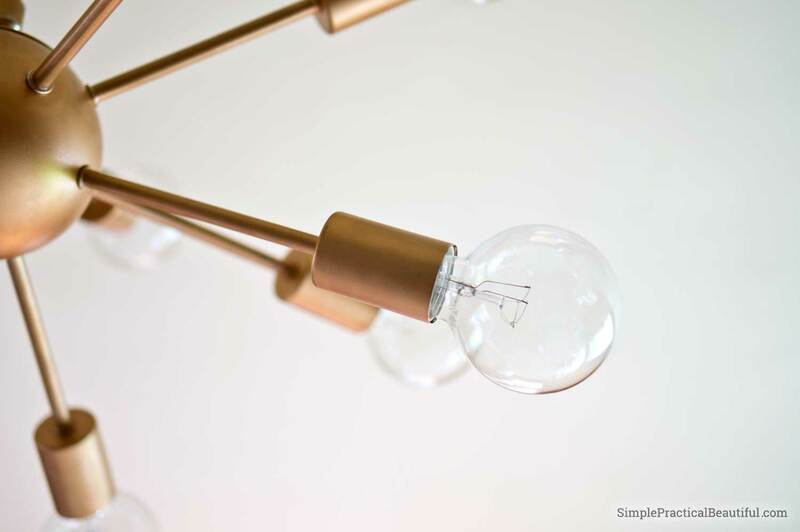 Our room needed a statement light, and a retro sputnik light was perfect. 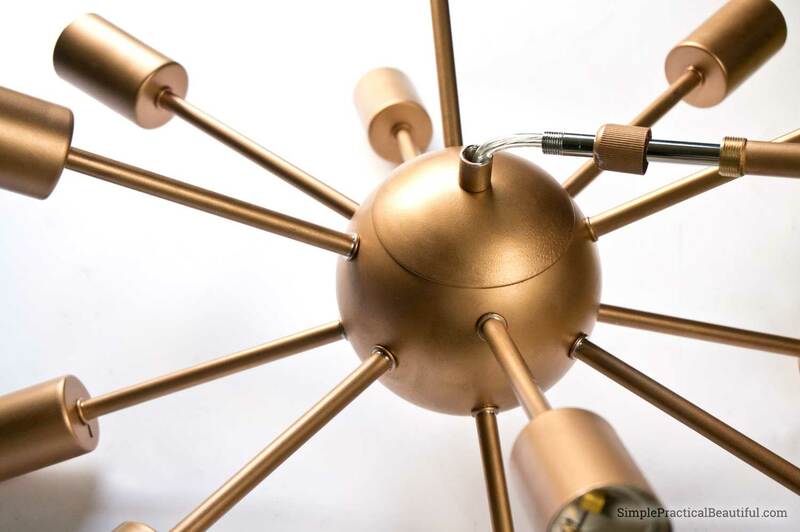 A sputnik light has a center ball with lights coming out in all directions. We looked at several different styles before choosing one we liked. I have to show you a few examples of what’s available because they are all pretty cool (you can click on any of them to see more details). 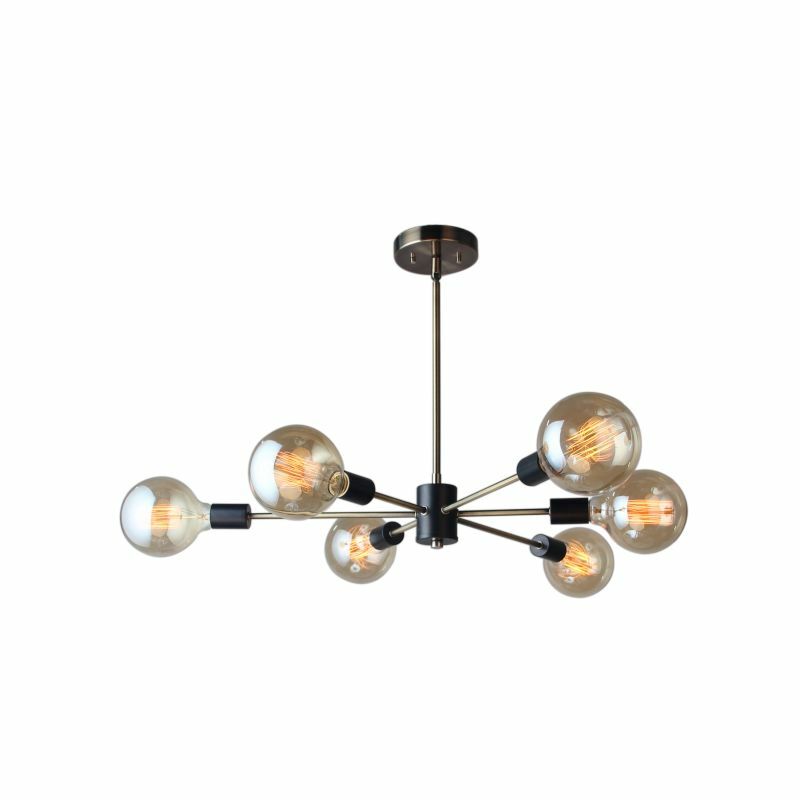 We chose the Unitary Vintage Sputnik with 12 lights from Amazon.com because of it’s simple style, it’s size, and it’s low price. It does need to be assembled, which gets a little tricky, but more on that later. The light only comes in chrome and black, so we bought the silver one and painted it gold to match our curtain hardware and sunburst. 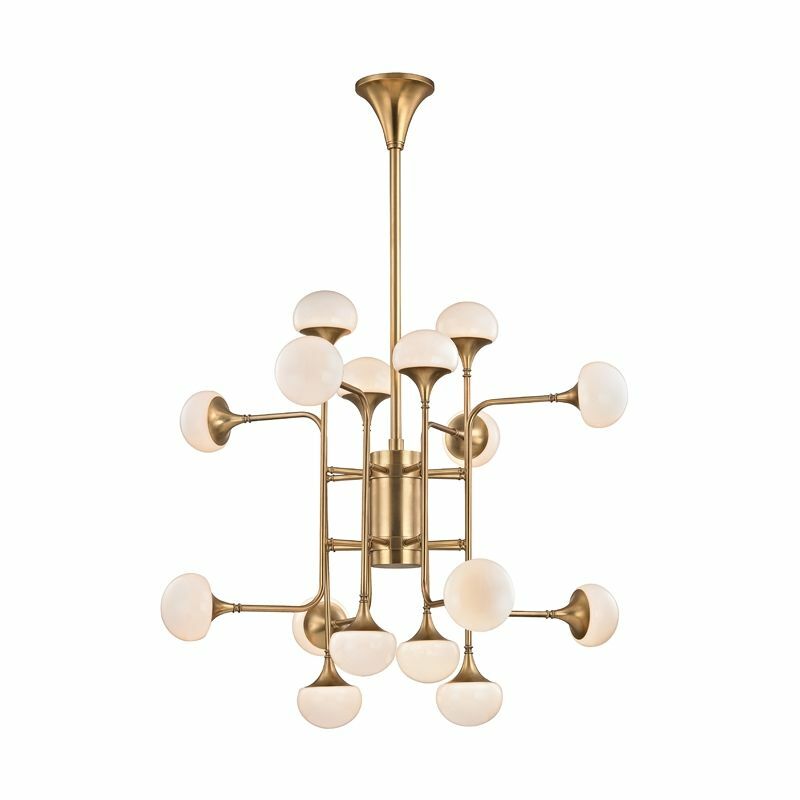 Gold just seems to go better with mid-century than silver finishes. The light is still in the center of the ceiling, so we would like to get more task lighting for a few of the corners of the room. 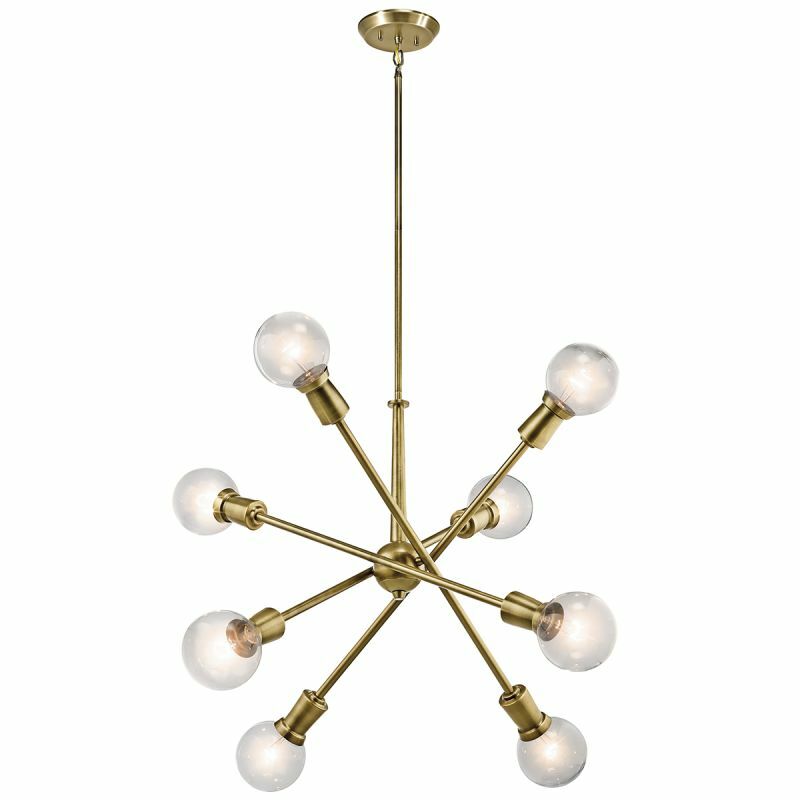 However, with twelve 60-watt light bulbs, this sputnik light gives off more than enough light for our entire 300-square-foot family room. It gives off so much light that we added a dimmer switch. Now we can turn the lights down low while watching tv or have a fair amount of light while playing with the kids or turn it up to the full 720 watts if we’re working on the details of our Halloween costumes. The room is now well-lit and welcoming. 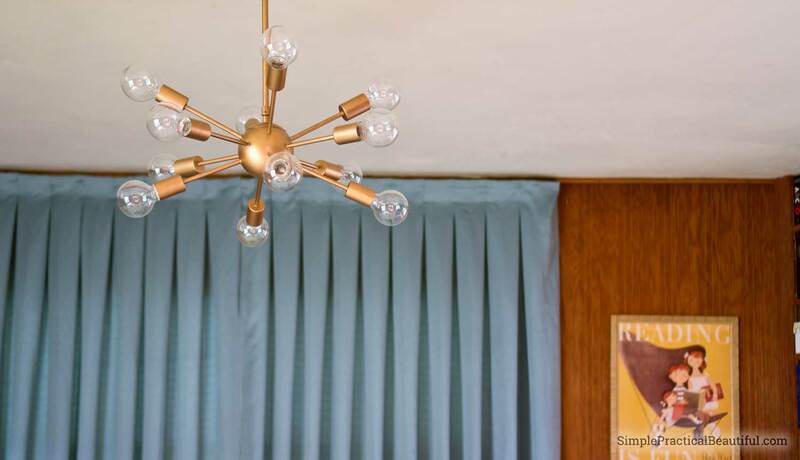 The light is warm and bright and highlights all the best parts of our mid-century room. Plus, the sputnik light is the first thing you notice from the doorway into the room. It really sets a fun atmosphere. As I mentioned earlier, the light has to be assembled. If you bought the Unitary light, or are thinking about buying it, let me share how we installed it. The directions that come with the light are terrible, but the good price for the light more than makes up for that. Before you assemble the light, make sure you know what you’re doing. Electricity is not something you want to experiment with. I’m happy to share how we put our light together, but you are fully responsible for the electrical work in your house. Hire an electrician if you’re not comfortable or sure how to do this. Or buy a different light. The light comes in pieces, but well-packaged. The first step is actually to take apart the one thing that is already together. There is a small nut on ball part of the light holding the lid on. The lid needs to come off so you can connect the 12 lights onto the ball. Once everything was apart, I painted the chrome a gold finish. First, I used Rust’Oleum’s Universal Paint in copper (a color I already had) because the Universal paint sticks well to everything, including metal. It made a good base coat for my Rub ‘n Buff to stick onto. I used antique gold Rub ‘n Buff to finish the light. It’s the same paint I used on my curtain rods and candlesticks, and I really like finished look it gives. With the light painted, I started assembling it. First, you attach all of the 12 lights to the center sphere by putting the light through the hole and screwing on a nut from the inside. One good tip is to start with the bottom lights first. However, my fingers are not small enough or long enough to fit into the sphere to tighten the nut. So I used a wrench to hold the nut in place while I screwed in the light. A little backwards, but it worked. With all the lights attached, there are twelve white wires and twelve black wires along with a set of clear wires sticking out of the sphere. The directions say to put all of the white wire together in one cap. Umm, no, not going to happen. It’s just not physically possible to get them all together. You will need to buy some extra caps and wire to pigtail the wires together. Pigtail the wires by twisting two white wires together then twisting on a third, separate white wire. Add a cap, then take the other end of that third, separate wire and connect it to two more white wires. Add yet another separate wire to those three then put on the cap. Take the other end of that last wire and connect it to two more white wires. 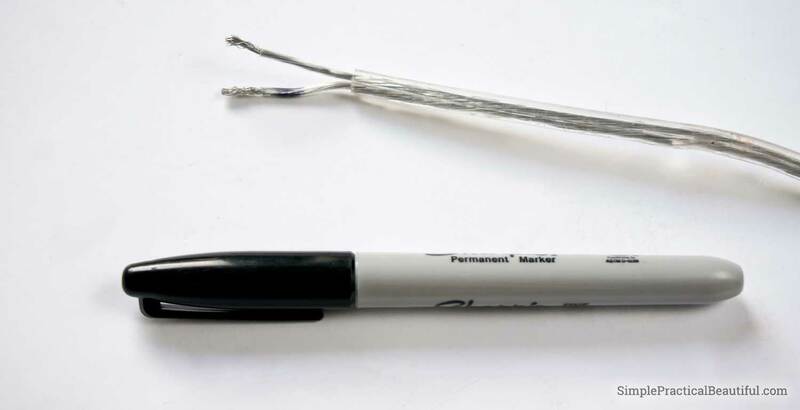 Add a separate wire and cap it. Continue this until all your white wires are in caps. You should end up with 6 caps. 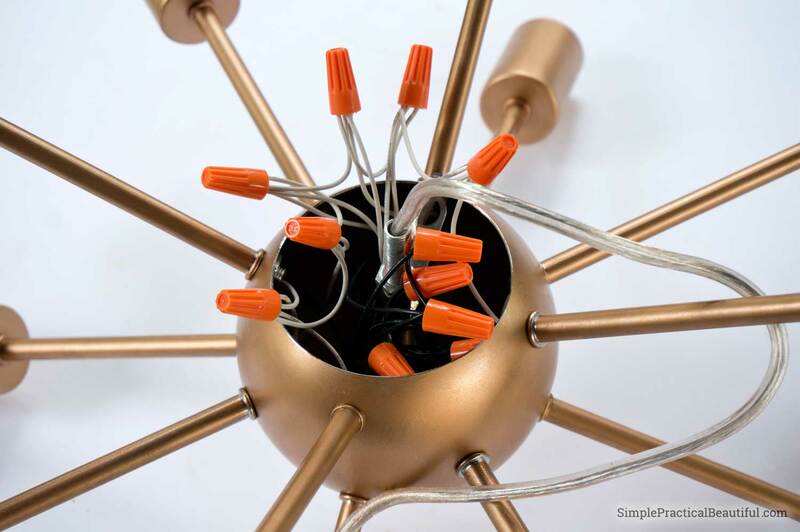 In the final cap, add one of the wires from the set of clear wires in the center of the sphere. I don’t know why they didn’t make those black and white. It would have made things a lot easier later. Once all of the white wires are connected and capped, repeat the same pigtail process with the black wires. Important: Do NOT connect any black wires with white wires. Ever. Black to black always. The final cap of black wires should have the other wire from the set of clear wires in the center. Because they did not make those center wires black and white, you will need to do that. The cord is clear, so we followed the wire connected to black to the other end and marked it with a black permanent marker. This way we knew which wire was black and which was white. You don’t want to connect the wrong wire in your ceiling or the circuit will be crossed. (Actually, we checked, double-checked, and triple-checked the clear cord to make sure we knew which wire connected to black). Once the wiring is all connected, carefully shove all the wiring into the sphere and put the lid and nut back on. Then thread the wire through the post and screw it into the nut. That’s it. The light is ready to connect to the ceiling. 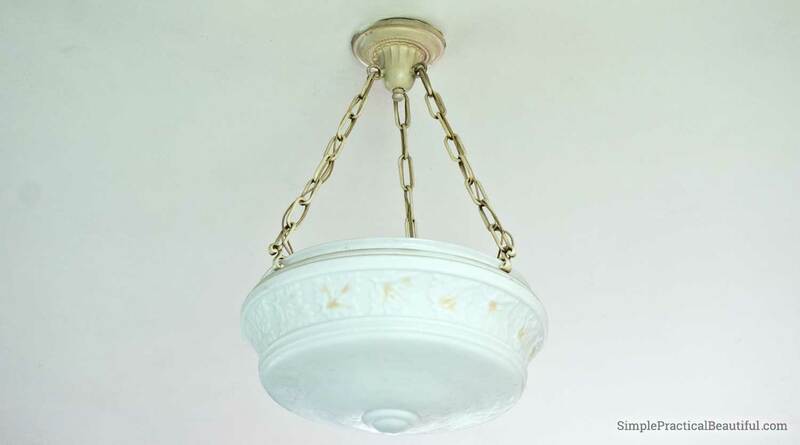 If you’d like, you can read about how to connect a pendant light to the ceiling in this post and if you’re bracket is the wrong size, you can read about how to adapt a new light to an old ceiling fixture in this post. 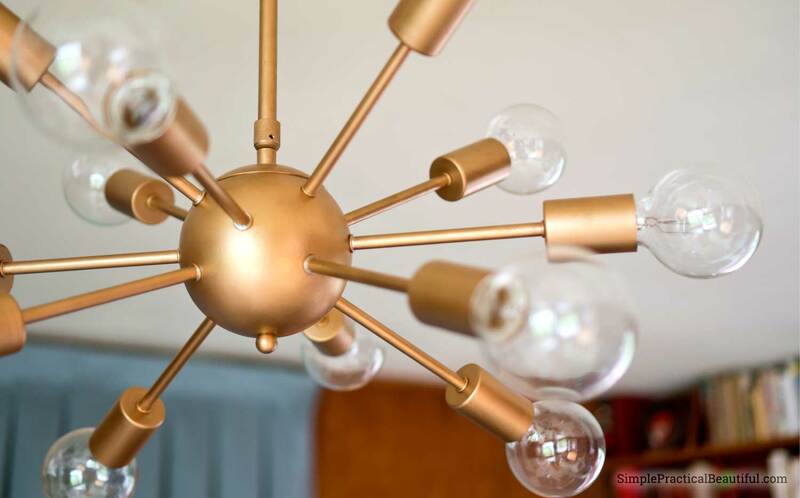 We love our new sputnik light. It’s the first thing you see when you walk into the room. I can’t wait to make more updates and improvements to our mid-century room. Thank you, and thanks for sharing. I love dimmers, especially for the central light in a room. love it! I’ve been eyeing another MCM fixture for a while, but yours looks stupendous! Thank you so much!! I love it too.